Ed Valentine | About That Jacket. This is all off the table if Melania denounces him, or better yet: leaves him tomorrow. 2) What makes it so bad is that it lays bare what we can see *with our own eyes to be the truth*: Trump does not care about migrant brown children. Much less for adult migrants: he called them animals. Said they’re infesting the US. This statement – and it is a statement – reinforces this inhumanity. And lastly: 3) I’m not inclined to give her props for going down to the border. Not any more. Children are going to die because of her husband’s cruelty. And now: she is complicit. She helped get him elected, helped normalize him, repeated ‘birther’ lies, stood by his side. She knows who he is. What he is. So a show of empathy to these poor kids at the border – even if it’s genuine – will be used by Trump – *is being used* – to burnish his image. To soften him. 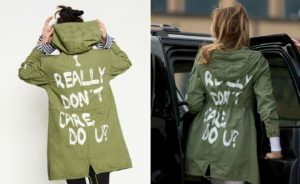 Whether she wants it to be or not, whether she likes it or not, it’s now *to his credit* that the First Lady visited these suffering children. It makes him look better by extension. 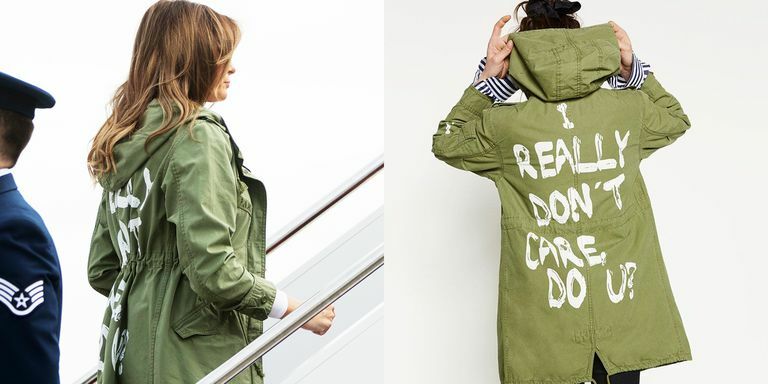 In some level, when we say, “we’ll, at least Melania went to visit…” it makes it easier to somewhere, back in our lizard brains, to say “gee, maybe he’s not so bad… if a good-hearted, sympathetic person could show a modicum of kindness.” Ok, maybe you’re not fooled. But his 40% of US supporters are. So in the end, this visit, this show… actually makes it easier for him to KEEP HURTING THEM. Or it would have…. before today. And this brings us back to the jacket. And the words on the jacket. Trump has been adept at using symbols and words as weapons. Extremely adept. So I’m sorry, Melania, but turnabout is fair play. You’ve given us a visual weapon to be used in November… and 2020… and whenever we need it. Don’t give in. Retweet it. Denounce it. Let them be tarred with this forever. This is Marie Antoinette’s “let them eat cake” times 1000 – especially since, FUN FACT: there’s no evidence Marie Antoinette ever said that. This is a photo. Images matter. Words matter. This image crystallizes the cruelty, malevolence, and incompetence of Trump and his administration. Use it. Use it forever. This entry was posted in Uncategorized. Share link: http://www.edvalentine.com/about-that-jacket/. Follow comments with the RSS feed. Post a comment or leave a trackback: Trackback URL.